Pro Women's start. Photo: Lyna Saffell. Alpine, UT — A soaking rain and cold temperatures couldn’t stop Utah’s finest from contesting the Lambert Park Super XC on April 20, 2013 in Alpine, Utah. Overnight rains forced race promoters to make some last minute changes to the world cup-style Alpine course eliminating some of the muddier sections in favor of more rocky trail sections. The course proved to maintain its excitement factor as riders relayed their enjoyment after the finish. The men’s pro division was the highlight of the day with a full field of 18 toeing the line. The race started with a blistering ascent up the longest climb of the day. Pro riders would do a total of 5 laps while the women completed 4. Geoffrey Montague got off to his usual fast start. Challenging for first wheel heading into the singletrack. Knowing a long section of singletrack descending was coming Nick Fisher (Rooster’s/Biker’s Edge) was not about to give Montague the holeshot and gassed it into the one track just in front of Montague. Once out front Fisher showed great early-season form to hold off the field lengthening his lead on each of the 5 laps. Montague and Wyoming rider Ben Aufderheide (The Hub) battled for second with Aufderheide finally getting the upper hand. Montague held on for third ahead of Sam Sweetser (Cole Sport) who recovered from a first lap crash and moved through the pack to take fourth followed by his teammate Will McDonald in fifth. The women’s race featured a strong field that produced more action at the front of the race. Jen Hanks (Epic Brewing/MTBRaceNews.com) gunned it off the line and led into the opening singletrack. She powered through the rocks and mud opening a lead of 10 seconds over Meghan Sheridan (UtahMountainBiking.com). Sheridan stayed strong and closed her gap to the leader by the end of lap one. Starting their second lap Sheridan attacked on the long opening climb and formed a gap of her own off the front of the race. 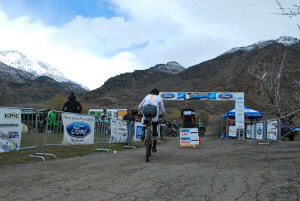 The UtahMountainBiking.com rider stayed smooth and controlled through the mud and rocks for the next two laps taking her first win of the season over second-placed Jen Hanks. Erin Swenson (3B Yoga) finished third.